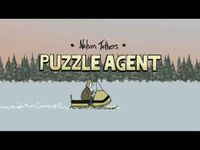 In Puzzle Agent, players take on the role of Nelson Tethers, the lead (and only) agent in the US Department of Puzzle Research, sent on a rare field assignment to Scoggins, Minnesota to investigate why output at the town's eraser factory - the factory that supplies the White House with all its erasers - has come to a screeching halt. The game combines brainteasers that include mazes, puzzles, logic and riddles, intertwined to tell an engrossing, twisted mystery story - all presented with Graham Annable's unique narrative and visual sensibilities and the distinctive Telltale style. Puzzle Agent combines generous doses of Nordic folklore, and an X-Files style mystery along with major influences of Professor-Layton inspired puzzling, David Lynch, the Coen brothers and a dash of Stanley Kubrick. And gnomes.